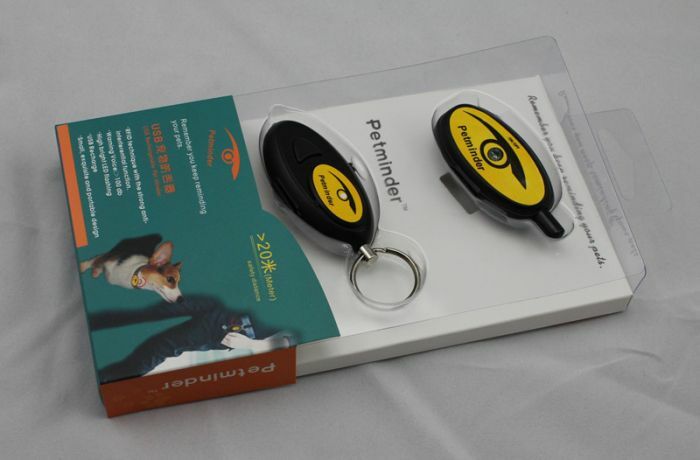 The USB Rechargeable Petminder (hereafter called it "Petminder") is a high-tech set of product, which adopts wireless transfer technology of communication system. Features advanced energy saving design, long stand-by time. 423 MHZ frequency, environmental lithium batteries are built-in. The Petminder including master, which including receiver belongs to pet owner and slave-master, which including transmitter belongs to pet. The master stand-by time is above 70 hours and the slave-master is about 30 hours after be fully charged. The Alert mode is as the master (pet owner) as the centre, 20 meters radius is the safety zoom, if the slave-master (pet) overreach the 20 meters radius, the alarming signal will be given to remind pet owner to search their pets immediately. Connect the USB cable the master or the salve-master to the USB port (computer, IPAD, USD charging etc device) to charge. The LED flashes during charging, when the battery is fully charged, the LED will be continuous lighting. The charging time is about 1 hour to 2 hours. Attach the slave-master (which including transmitter) on dog collar, and keep the master (which including receiver) with pet owner, turn on the switch for the both, when the LED indicator on the slave-master slowly flashes, the two devices are connected. The slave-master MUST be attached on pet collar, the collar size could be adjustable to a suitable range according pet neck size. The maximum size is 65cm. The Alert mode is as the master (pet owner) as the centre, 20 meters radius is the safety zoom, if the slave-master (pet) overreaches the 20 meters radius, the alarming signal will be given to remind pet owner search their pets immediately. When pet runs out of safety distance >20 meter, the master for owner will alert with fast and continuous sound "bi-bi", and the LED indicator will flash to remind pet owner to look for their pet Immediately. Pet owner can press the button to pause the alert. And 5 seconds later, the device will alert again, repeatedly until pet gets back to safety zoom or the power of the master is turned off. For the master: It alerts with slowly and continuous sound "bi-bi-bi" to remind user to recharge battery. For the slave-master: LED indicator flashes twice discontinuously, meanwhile alerts with two sound "bi-bi" to remind user to recharge battery. Press the button on the master for several seconds, the LED will ON, so to keep pet and pet owner safe in the dark; press the button again, the LED will OFF. Attention:After fully charged, the master standby time is over 70 hours and slave-master is over 30 hours. For guaranteeing the alert function works smoothly, please charging in time. The device may make “bi-bi” sound due to environmental influences, this is normal.